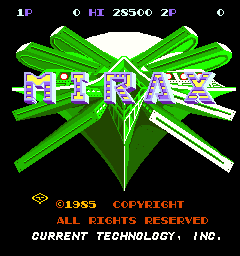 Arcade Video Game published 34 years ago by Current Technologies, Inc.
Mirax © 1985 Current Technologies. A great space shooter game using a 3-D sprite-scaling technology. 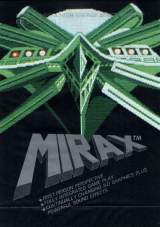 The invaders from the alpha centauri empire are building their super laser weaponry in the mirax city. This weapon of mass destruction is a danger to the galaxy and your space colony, the destiny of the galaxy is in your hands. On your 90.000 mile journey to this giant space city will encounter to hordes of enemy forces, you must speed your spacecraft while you shoot and dodging energy stations objects, enemy spaceships, giant bosses and missiles. Your mission is to destroy all weapons construction units to restore peace before it is too late .